So many of you long term followers know that I am a Chicago girl. Born and raised in the south suburbs of the big city! My husband and I moved to Ohio 6 1/2 years ago and there is a short list of things we miss about the big city. 1. Our family. While we are only 4 1/2 hours away from my parents, it’s not the same as being able to stop by and have dinner on the weekends. And with my brothers popping out babies since we left, (well, their wives popped out babies to be exact), I miss all my nieces and nephews too! 2. Our friends. We are blessed to have THE BEST FRIENDS anyone could ask for! You just can’t replace your friends, or your neighbors. And we were very lucky to live next to some of the greatest families! So, pizza. Everytime we go back to visit our family and friends we always try to make sure that take out pizza is involved at least once during our visit. We used to go as far as ordering half baked deep dish pizzas and bring them home in a cooler to freeze for later. Oh, how I love a Deep Dish Sausage Pizza! Then I went shopping at Findlay Market here in Cincinnati. And I saw it. Hot Chicago Italian Sausage. YES!!! I picked up several pounds and my mind was spinning. I knew I had to make a deep dish pizza. But where to start? After searching the internet, I decided I needed to combine bits and pieces from about 4 recipes (maybe 5) and make my own version. It turned out perfect. The crust was chewy and buttery (very important), and the filling. OMG the filling. And the tomatoes on top. DELISH. 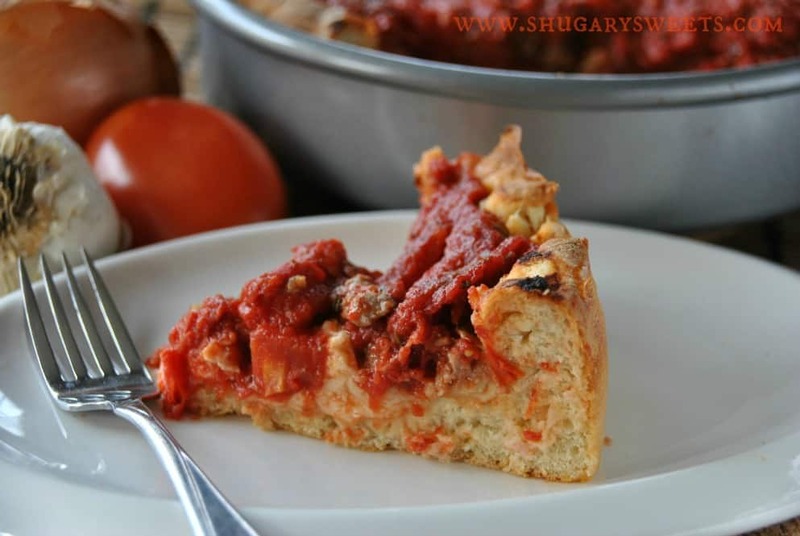 This recipe creates TWO deep dish pizzas. I used my 9inch cake pans (they are about 2 inch deep) to bake this pizza. You can certainly use authentic pizza pans if you have them! ENJOY!! Family, Friends…I’ve been using you as a crutch all these years to come home for pizza. You will never see me again. haha, kidding. But we can stop ordering pizza and instead focus on Portillo’s! Now to recreate the perfect Italian beef sandwich! For the dough, in a large mixing bowl, combine, flours, yeast, salt and sugar. Slowly add water and olive oil. Mix with a paddle attachment for 2 minutes. Remove and use dough hook to knead dough for 2-3 minutes. Remove and put in a greased bowl. Cover with saran wrap and allow to rise 2 hours in a warm place (I put it on top of my dryer). Divide dough into two balls. Using hands, knead 1 Tbsp of softened butter into each dough ball. Put into a 9inch cake pan (or deep dish pizza pan) and allow to rise and additional 1-2 hours in a warm place. Brown italian sausage in a large skillet, breaking up into small chunks. Make sure your sausage is removed from the casings. If you can't find the HOT Italian sausage, add a pinch or two of red pepper flakes. Drain sausage completely. In a large pot, combine tomatoes, salt, pepper, oregano, basil and garlic salt. Simmer while dough rises on low heat (about 1-2 hours). When ready to assemble pizzas, press dough lightly with fingertips to bottom and sides of pan. 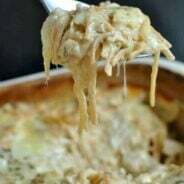 Lay 2 cups of shredded cheese in bottom of pizza. Top with browned sausage and about 2 1/2 cups of sauce. Bake in a 450 degree oven for 25 minutes. Allow to sit for about 10 minutes. Slice and eat. ENJOY! I actually visited Chicago once but didn’t try any deep dish pizza while I was there which I am now kicking myself for. I’ll have to try this recipe and see what the fuss is all about! This looks ridiculously similar to the deep dish pizzas I love!! Nice work. And you are absolutely right, half the battle is making sure that the crust is perfectly buttery and not too dry. I can’t wait to try this recipe! Buttery crust with NO cornmeal is the key! I agree – Chicago deep dish pizza is superior (and I’m originally from the NJ area!). I finally broke down and made the King Arthur Flour version and loved it. Will have to give your recipe a try too! My only complaint with the KA version is the cornmeal. Otherwise it looks delicious!! where was this YESTERDAY? All I wanted in the world was super, delicious pizza. I was going to attempt to make one myself, but the sauce just wasn’t what I wanted. Ended up at Uno’s instead (still pretty delicious). Sorry, I had no idea you needed this yesterday 🙂 Now you have it for the next time!! Oh man, the boyfriend would love this. He & I are in a continuous argument about what pizza is best (I’m a thin crust gal, anything else and I really just don’t like it. Sorry! 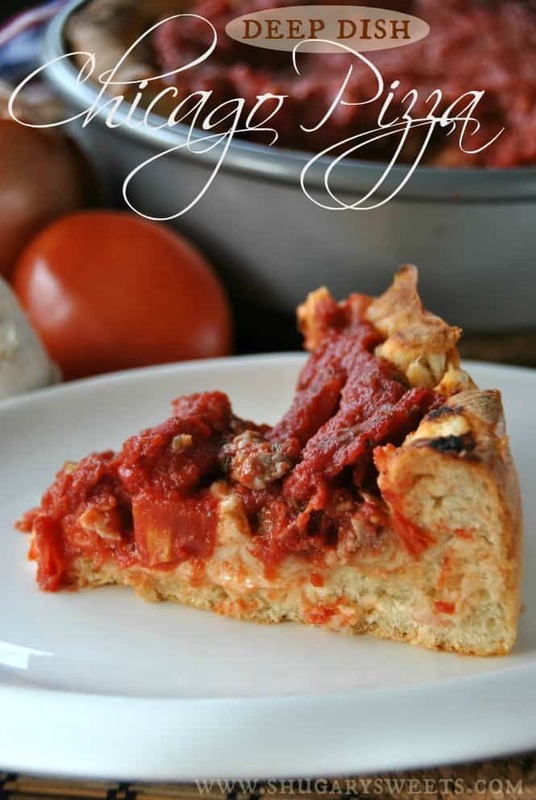 )–he’s firmly a deep dish guy! went to Chicago in Sept and we loved it. I really loved the pizza, have to give your’s a try! My husband was born & raised in Chicago and when I was living there, that’s when we met! The pizza crust I made last week on my blog was an ode to his kind of pizza! Looks like you hit a winner with these! I had no idea that your hubs was born and raised there (at least I don’t remember). Where abouts? This looks amazing! I lived in Chicago for a summer and haven’t had this pizza since. YUM!! Tell me you are missing it, right? I think you need this in your life, soon! There is nothing like a Chicago deep dish pizza. It is always a must when we visit the city! Yours looks just like the ones we order there! Very yummy!!! I think we need to get pizza together!!! It totally is your blog, so I get it, but as a Jersey girl I have to say I really love the pizza over here in the Big Apple 😉 Though I would LOVE to one day visit Chicago (I’ve never been!) and try out their famous deep dish pizza. Until then, totally putting your KA version on my must-make list! I love deep dish pizza! Wow this looks good. Pinning this for sure! Eeek! 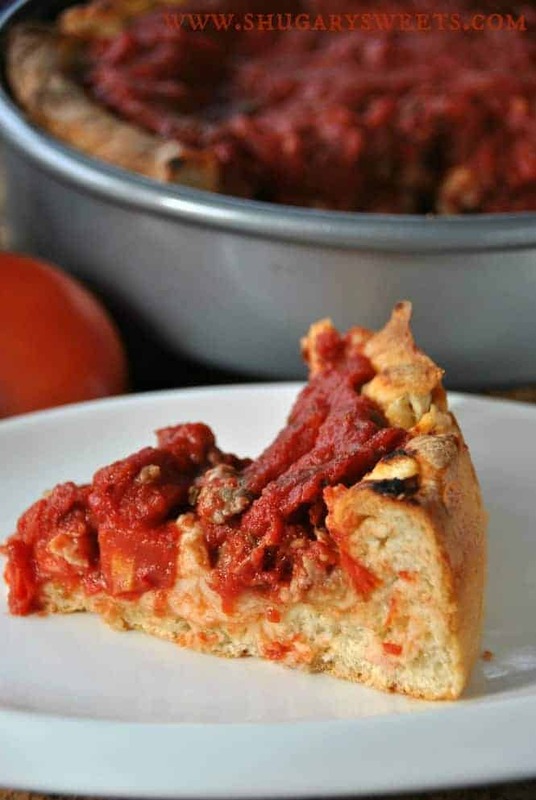 I’ve been wanting a deep dish recipe to try out on the hubs. Perfect! I grew up in Naperville….. Oh do I miss the pizza…..and Portillos…..and Oberweis. Naperville YES! Hubs and I lived there many years, love the downtown area. Oberweis has the only chocolate icecream I like. Do you go back often? When I went to Chicago a few years ago to visit my friend who was going to school there, she took us to this really popular deep dish pizza place. I want to say it was Grimaldi’s but I could have the name COMPLETELY wrong. Anyway, I never had deep dish before and I fell in love. SO SO good. I love that you just showed us how to make it because I never attempted it before but I might just have to so I can bring Chi-Town here! I don’t recognize the name Grimaldi’s…but any deep dish chicago pizza is delicious! I hope you try this!! This looks fantastic! And I didn’t know that you were from Chicago – I’ve spent a lot of time traveling there and there is SOOOO much good food. YUM! You’re right, there are many delicious food joints in Chicago!! I’m thinking I may need to go to BlogHer Chicago this summer…. 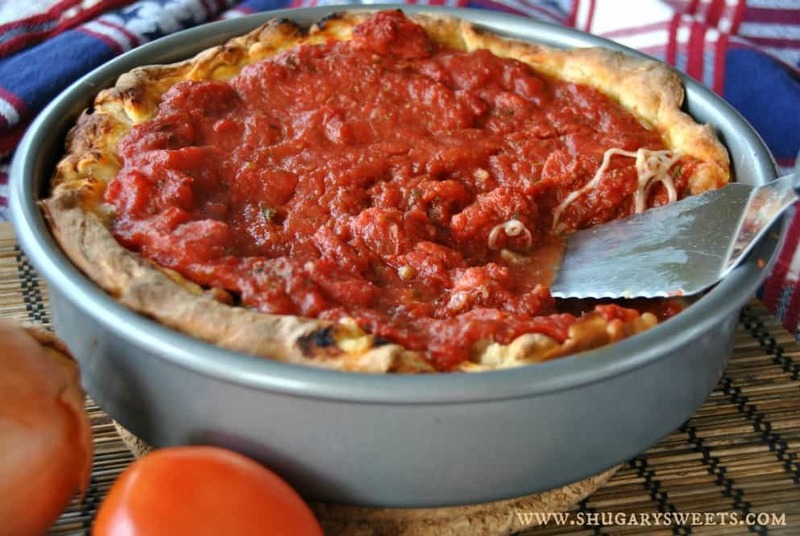 I have never had Chicago deep-dish style pizza, but I’ve seen one on Travel Channel that looks just like this and I want it. And your comment at the end was funny – every time we go to my parents I have to order pizza – something about the sauce and crust is to die for. I need to recreate it! Oh yummy! Pizza pie! 🙂 I don’t think I have ever tried deep dish pizza. I’m almost ashamed to say that I’ve never had a Chicago style pizza – and I think my life is somehow missing something!! Must make this – goodness it looks insane! I’ve got you covered. Nobody needs to know that you’ve never had it. Just make this recipe, it comes pretty close 🙂 thanks for stopping by megan!! I usually go for thin crust pizza and those are more available here in CA. But after seeing your deep dish pizza, so decadent and rich, and packed with goodness, I think I need to convert myself to get my Chicago deep dish pizza fix. 🙂 Thank you for sharing your recipe so I can make one at home! You’re welcome Amy! I hope you do give it a try!Don’t get me wrong, I still love a good thin crust pizza too, but sometimes pizza night calls for deep dish! Oops, logged in as my husband!! Can you substitute for the bread flour?? Pinning this! Kristin, you can certainly use all purpose flour for the bread flour. I find that adding in the bread flour helps create a nice chewy crust that rises a little bit more. But, if in a pinch, all purpose will be close! I’m a Chi-town girl, born & raised here, too. Can’t wait to try making this d-lish looking pie! What pie from Chicago would you compare it to? -And, I have to ask…what’s your favorite pizza here? Wendy, I would compare this to a Giordano’s Deep dish. I prefer that over Lou Malnatis. My favorite pizza would be Aurelios as I grew up in Homewood where the original one still holds my heart! Oh man does your deep dish pizza look good!!!!!!!!!!!! I am so making this next week!! I love your recipe! Thanks Jennifer, let me know what you think when you make it!!! So good! Is it weird that I want this for breakfast? Man, I LOVE LOVE LOVE Findlay Market!!! Great find and great way to use the sausage! No, we don’t anything about pizza here in Cincinnati! Although I do love my Dewy’s! Let me know if you give it a try. YUM! It is great Erin!! Oh I more than “liked” this pizza, we were in LOVE. It will be happening again here this weekend!! Greetings from the souf side! When we don’t feel like spending a fortune we make our own and we cheat when we do it too! Fridge dough (pillsbury), cheese, Italian sausage (like jewel/ johnsonville), and spaghetti sauce. Still delicious and pennies to make. one of my friends is from Chicago, and he always talks about pizza – he misses it so! his brother overnighted one once, and he was SO excited! I got to try a slice (my first and only!) and yep – some good stuff. You MUST try this then Heather! Worth every bit of effort! This looks so good! We just had one from UNO’s during the Super Bowl and I told the boyfriend we need to try one from scratch – this will definitely be the recipe. oh man does this look good! Major pizza craving now! When I lived in Chicago I fell absolutely in LOVE with their pizza! I’ve gotta make this. Yes, you must try this!!!! Oh my, Aimee!! I lived in Chicago for 6 years and Gino’s East was my very favorite place for pizza (of course there are many other great pizzarias in Chi-Town!) Even after the old restaurant burned and they moved, the pizza was still the best, mozzarella-gagging (true Chicagoans know what I’m talking about!) thing on this earth!!! LOL Thanks for posting this recipe!!! I just ordered two deep dish pizza’s from Lou Malnati’s to be delivered sometime tomorrow. I’m going to try this for sure. I lived in the northwest suburbs for 36 years. I miss pizza, italian beef and the french bread. Hurry up and come up with a good recipe for the italian beef!! Julie…. Lou Malnati’s is wonderful too!! I didn’t know they delivered out of state!! Wonder if Gino’s East does?? hmmmm??? Julie…. Thank you, thank you, thank you!!!! Born and raised on the Southside of Chicago I too know the wonder of Chicago style deep dish pizza. This looks delicious and I will have to give it a try. It is a MUST for anyone visiting our city! Totally AGREE! I grew up in the Homewood Flossmoor area, so I’m a bit impartial to Aurelios. But when I want DEEP DISH I go for Giordanos. YUM. Living in NYC I want to make this to compare to my regular pizza… I hear such rave reviews on Chicago deep dish! I’m from ‘New Yawk’ and love me some pizza… My son and his family now live in Chicago area and my daughter in law loves her some deep-dish… (I hesitate to call it pizza 🙂 ) her favorite is pepperoni with Spinach and I have to say it is delicious. I thought maybe I’d make some deep dish for her while they are here for Thanksgiving…can’t eat Turkey every night. Some recipes call for a regular NY-type pizza dough and I knew that wasn’t right…it’s not the same. Glad to see yours’ is authentic. It’s like from my big fat greek wedding… NY Pizza is like an apple and Chicago pizza is like an orange – they are different, but they are all fruit…(in this case pizza!). This pizza was absolutely delicious. 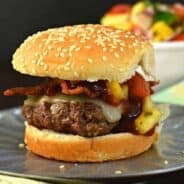 Just wanted to thank you for sharing this recipe. My son couldn’t believe I had made it. The crust is way better than the recipe I had. 🙂 Be blessed. This seems to be wonderful! As well as We didn’t realize that you’re via Chicago, il – I’ve invested considerable time traveling generally there in addition to there may be So much excellent foodstuff. YUM! I’m not a Chicagoan by birth but that city is my city – I’ve lived there twice in my life. I, too, have lived in Cincy and Donatos and LaRosas have NOTHING on good Chicago deep dish. 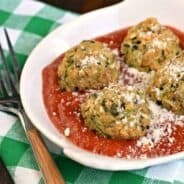 So thank you for this recipe – I’m a Navy wife who will probably not return to the city anytime soon but now I can make this for my family! Now THIS is a pizza 🙂 Yum! 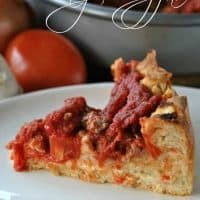 I’m a Malnati’s girl and have been looking for a good deep dish pizza recipe. Minnesota has nothing. For the Italian beef, try the Instant Pot version. It’s pretty close to Portillo’s. I miss Chicago food on a daily basis.